By early January 1945, Gross Admiral Karl Doenitz had realized that Germany was soon to be defeated and, wishing to save his submariners, had radioed a coded message on January 23rd, 1945 to Gydnia (Gotenhafen) to flee to the West! The Operation was codenamed: Hannibal. Submariners were then schooled and housed in big ships laying in Baltic ports, with the bulk of them at Gotenhafen. They were the Deutschland, the Hamburg, the Hansa and the Wilhelm Gustloff. In early March, a task force comprised of the pocket battleship Admiral Scheer accompanied by three destroyers and the T-36 topedo boat (the same which had played such a great part in the rescue of the Gustloff's survivors) were giving cover to a German bridgehead near Wollin. During that operation, naval landing crafts managed to evacuate over 75,000 refugees who had been isolated in that area. Thery were taken to larger warships and other transports laying offshore. While a number of big transports were sunk, one must remember that big liners such as the Deutschland managed to break through and carry up to 11000 souls each. Early April. Operation Walpurgisnacht. Eight thousand men of the 7th Armoured Corps were rescued from the Oxhofter Kampe and were taken across the bay to Hela. On the nights of the 4th and 5th of April. A flotilla of small boats, landing crafts etc evacuated over 30,000 refugees from the same Oxhofter Kampe and took them to Hela. On April 15th, another large convoy consisting of four liners and other transports left Hela with over 20,000 refugees. One of the escorts was, again, the T-36. They, too, made it safely to their port of destination. All told, nearly 265,000 people were evacuated from Danzig to Hela during the month of April alone. May 1st to May 8th. Over 150,000 survivors were evacuated from the beaches of Hela during that period. They were ferried aboard small vessels to transports and warships where they embarked. One of those warships was the T 36 and this was to be her last voyage. On May 4th, she was bombed off Swinemunde and after hitting a mine, she sank taking with her Lieutenant Commander Robert Hering. The T-36 had been engaged without respite on convoy duty since the beginning of Operation Hannibal and had contributed to the savings of many of the survivors during that period. Earlier on in January, the Russians had reached the Oder River, and were but 100 miles from Berlin, and in fact had overrun thousands of German refugees, both civilian and military in these areas. A vast fleet of ships was assembled to rescue these people, and, an incredible 2,116,500 people were picked up to be transported by sea to a safe area. This rescue operation enjoyed over a 98% success rate, and of this total, about half a million were military personnel. When compared to the rescue of the British Expeditionery Force from Dunkirk in 1940, this lift of refugees fleeing from the advancing rapacious Russian army was seven times greater. The Wilhelm Gustloff, General Steuben and the Goya, were three German ships crowded with evacuated refugees and wounded soldiers that were struck by Soviet submarines during this period. The first of these to go down was the Gustloff, a 25,000-ton converted luxury liner that had been serving as a hospital ship. The Gustloff (25484 BRT) was launched in 1937 as the crown jewel of the Kraft durch Freude or Strength through Joy organization (KdF). The KdF was a subgroup of the Deutsche Arbeitsfront or German Labor Front (DAF). The DAF had been organized in place of unions which had been banned by the NSDAP. The DAF had as its goal the control and direction of the entire German labor force, and the KdF was used as a means towards this end by providing activities such as trips, cruises, concerts, and cultural activities. These events were specifically directed towards the working class and it was through the KdF that the NSDAP hoped to bring to the "common man" the pleasures once reserved only for the rich. By opening the door for the working class to easily and affordably take part in activities once reserved only for the rich, it was hoped that the labor force could be lulled into being more flexible and productive. The Gustloff in its KdF heyday. The Gustloff as hospital ship “D” (Note the stripe painted on its side.) The stack also bore the Red Cross to inform of its status as a hospital ship. When the Gustloff left the Baltic harbor of Gydnia (Gotenhafen) on January 30, 1945, it was jammed with nearly as many as 10500 refugees, and wounded military servicemen. Shortly after nine o'clock in the evening, it was struck by three torpedoes from Soviet submarine S-13. Convoy vessels were able to rescue only about 900 from the sub-freezing Baltic waters. Eleven days later, shortly after midnight on February 10, the General Steuben sank with a loss of 3,500 lives, making this the third worst maritime disaster in history. The same Soviet submarine that had attacked the Gustloff, and in almost the same location, sank the Steuben with two torpedoes. Crammed with as many as 5,000 wounded soldiers and refugees, the converted passenger liner sank in just seven minutes. The sinking of the Goya on April 16, 1945, just three weeks before the end of the war in Europe, is acknowledged as almost certainly the greatest maritime disaster, in terms of lives lost, of all time. The converted 5,230-ton transport ship had set out from Hela near Danzig (Gdansk) with its human cargo of some 7,000 refugees and wounded soldiers. Just a few minutes before midnight, the Soviet submarine L-3 fired two torpedoes at the Goya, which found their marks amidship and stern. Almost immediately the ship broke in half, her masts crashing down upon the passengers crowding the decks. Before anyone could escape from the holds, the onrushing sea quickly drowned out the anguished screams of the refugees below. The vessel sank in just four minutes, resulting in the loss of nearly 7,000 lives. There were only 183 survivors. Although little known, the sinkings of the Wilhelm Gustloff and the Goya -- with a combined loss of more than 12,000 lives -- remain the greatest maritime catastrophes of all time. Moreover, the deliberate and unnecessary killing of thousands of innocent civilian refugees and helpless wounded men aboard the Gustloff, the Steuben and the Goya -- as well as many other smaller and lesser known vessels -- is unquestionably one of the great atrocities of the Second World War. Lesser known but also worthy of note is the sinking of the German battleship Bismarck on May 27, 1941. Following intense attack in the Atlantic from British planes and four major British warships, it went under with the loss of some 2,200 men. 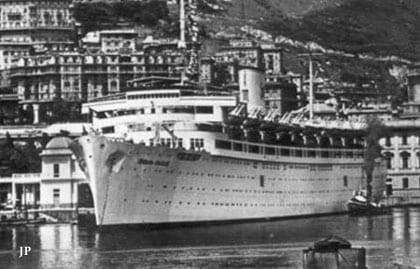 Even more tragic is the case of the Cap Arcona, a 27,650-ton converted German passenger ship packed with evacuated concentration camp inmates. On May 3, 1945, just a week before the end of the war, it was sunk by fire from a British fighter-bomber as it was moored in Lübeck harbor. 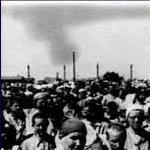 Some 5,000 persons, nearly all of them inmates, lost their lives. Only about 500 could be rescued. A similar fate befell the Thielbek, a German ship likewise packed with 2,800 inmates who were being evacuated from the Neuengamme concentration camp. Succumbing to intense fire from British war planes, it sank on May 3, 1945, with the loss of all on board. Admiral Donitz, the man in command of the U-Boat campaign, maintained a very close relationship with his Boat Captains. Donitz would meet with his returning crews at bases such as Lorient, usually accompanied by both a brass band and a large retinue. His U-Boat crews called him "The Lion." He had been described by one of his Captains, as lean in appearance, brief in speech, and stern in his demands. He would pass down the ranks of parading crews, shake hands with each man, bestow medals as he considered appropriate, and then tell these men of U-Boat Command - "You have three duties. To pursue, to attack, to destroy." At the Nuremberg Trial Donitz was indicited on four counts and convicted on two. He was sentenced to ten years imprisonment, and was perhaps unlucky to draw such a sentence. Donitz was released in 1956, and then wrote an autobiography "Ten Years and Twenty Days." focused on the U-Boat war and his very brief time as Head of State. The Soviet Sub Captains who were responsible for the mass murder of civilians and wounded soldiers were of course looked upon as heroes. As usual, real 'holocausts' are hidden from history. It's a war crime, but no one was/will ever be prosecuted. Soviet Captain Alexander Marinesko was commander of the S-13 submarine. He was responsible for the sinking of both the Wilhelm Gustloff and the General von Steuben, which occured a few days apart. Both were transporting refugees and wounded and between them only a few hundred survived. Marinesko made no effort to help any survivors in the water. Marinesko received the "Hero of the Soviet Union" designation for his efforts. Truly a disgrace in the annals of naval warfare, especially in light of the fact that Donitz was sentenced to ten years in jail for far less. It's mentioned in a lengthy footnote by Werner Maser in TRIBUNAL DER SIEGER. the verdict was also against him. Did the Wilhelm Gustloff change her identifying markings from hospital ship to military when her role changed to troop barracks and carried anti-aircraft guns? I see "history" gladly calling the Gustloff a military transport at the time of sinking. Sickening how legalese could burry the concept of willful targeting of a cruise liner. The sinking of the Russian SS Armenia in 1941 is another giant loss of civilian life in the Black Sea with murky legality. Similar to the Gustloff, she had been used as a hospital ship but carried anti-aircraft guns. Russia is still propagandizing this event as the biggest shipwreck, ever. It is also "settled" the Germans saw the red crosses but fired anyways. The Bolsheviks were outside the Geneva, or is maritime rule different altogether?